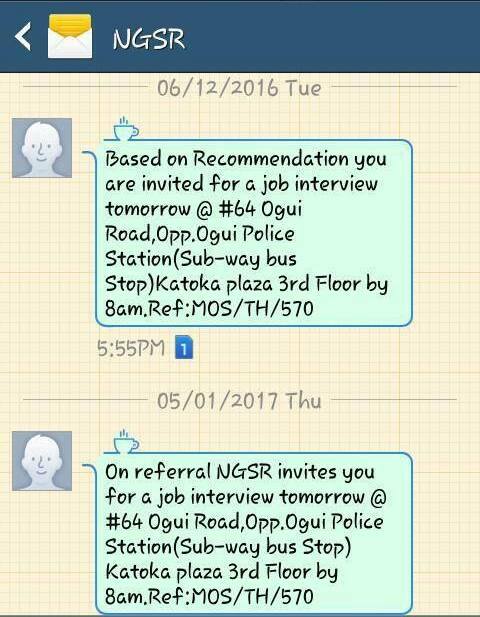 I’m doing this not only because these companies waste people’s time, energy and Transport fare going to such interviews, but also because most of these scammers extort money from hapless job seekers thereby making their suffering times two. Imagine a scammer extorting ₦10,500 from a graduate who has been unemployed for years, not to talk of the transport fare wasted going to such fruitless interviews or job chat as they usually call it. Having said that, there are ways by which one can identify a fake or scam interview invitation and therefore avoid such waste of time and money. The good thing is that most of their messages come in the same format so you will know its fake! 5. You will see HR Admin in the message instead of the company name. And pls, ignore those people sharing job flyers on the streets, and those ones they paste on walls. Those are scammers and some ritualists too. And also most of these so-called agencies are avenues for duping unsuspecting job seekers. Pls, shine your eyes well well. Please if you have any experiences in the hands of these scammers kindly share it here so that others can learn and avoid them too. Thank you. Image Credit: Status Update by Chinonso on Facebook.